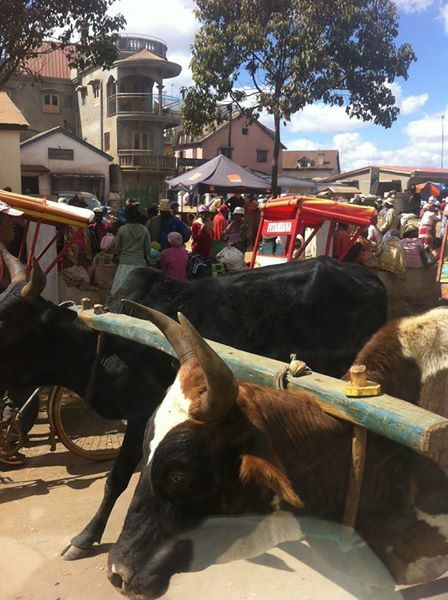 An ox cart viewed from a taxi-brousse window. 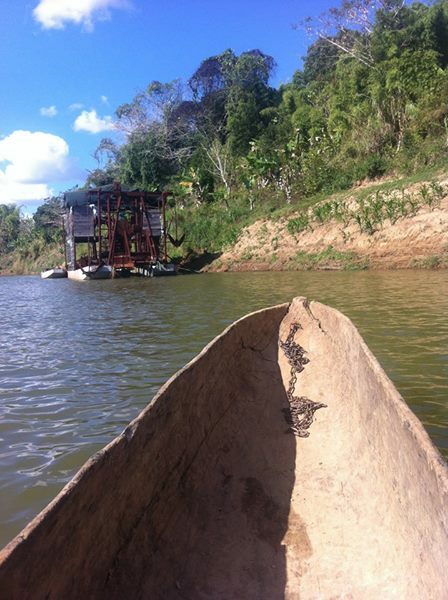 View from a dug out canoe in Madagascar. Airfare from the U.S. to Madagascar is quite expensive and it can be a long, grueling plane ride even for the experienced traveler. So my advice is, if you do visit Madagascar stay as long as feasible, don’t come for a week long vacation, it’s not worth it and you won’t see nearly enough. I suggest a month minimum and even then, you should focus on one region and not try to see everything. Madagascar is a place with an interesting culture seeming to be a mix of African, Asian and European influences and a language all its own. Speaking French is very useful, especially in the larger cities and more and more commonly you’ll find someone who speaks a little English. That said, in truly rural areas, you’re likely to encounter no one that speaks much of anything besides Malagasy. So it’s useful to at least learn basic greetings, numbers (although they often use French numbers) and how much does this cost? In Malagasy. This isn’t easy since it’s not exactly a language taught in most high schools but this page is a good start and also has a link to buy an English-Malagasy dictionary. Another essential part of travelling Madagascar (especially if you want to get off the beaten track or travel like a local) is using the taxi-brousse system. A taxi-brousse is usually a large van used as public transportation between cities and villages. Sometimes you can flag one down on the road if it’s unloaded some passengers but more commonly you get a reservation or just show up close to boarding time at a taxi-brousse station (any local and especially taxi driver knows where the station is). Sometimes you just have to wait at a designated place along the village road for a taxi-brousse to stop at a given time, so ask the locals when and where. Taxi brousse’s are usually extremely crowded, too slow, too fast, cramped, hot and late to leave and arrive. I’ve had children vomit on my lap and chickens defecate on my sandaled feet while on taxi-brousse’s but they are the most authentic way to travel like the locals do. One thing to keep in mind is that if you’re obviously a foreigner, the taxi-brousse drivers will try to give you an unfair price, so it’s helpful to ask locals how much a certain trip costs and stick to your guns that you’re not going to pay more than the locals pay, unless you don’t care. This becomes more of an issue if you’re in the country for long months as an unpaid volunteer as I was. Madagascar is an undoubtedly damaged nation as far as it’s wildlife and government systems go. There is still the shadow of imperialism over the country which is sometimes apparent in the dealings between locals and westerners. Most of the native forest has also been destroyed but with a little work, there is still plenty of amazing, endemic wildlife to be seen from lemurs to chameleons found nowhere else on earth. There is little of danger when it comes to wildlife, no large predators and no dangerous terrestrial snakes, the only threat being one dangerous scorpion that is rarely encountered (except in the dry south) and or course disease. Many of the parks in Madagascar require you hire a guide, which might seem a little annoying if you’re an independent traveler just keep in mind, this is one of the ways that the locals get money injected into their economy, which they desperately need. Guides are also inexpensive, knowledgeable and helpful in finding wildlife and understanding your surroundings even for the more experience wildlife viewers. My main advice for Madagascar is to travel like a local, explore as much as possible, be patient with transportation, keep an open mind and don’t have a rigid schedule. It’s also a great benefit to volunteer for one of the many humanitarian or environmental organizations on the island. It’s one of the best ways to truly experience the local way of life and see the natural beauty of Madagascar.